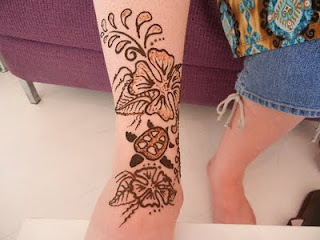 Popular request has won me over and I've created some henna design eBooks for purchase! Currently we have 2 eBooks offered with more on the way. 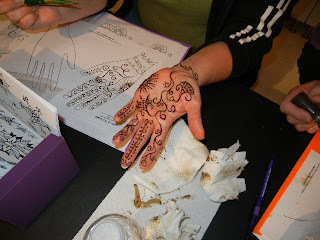 Henna Basics & Beyond: The Science and Art of Henna This eBook is specially designed to help you learn the vocabulary of henna tattoo designs by breaking down designs into the basic elements of henna design. 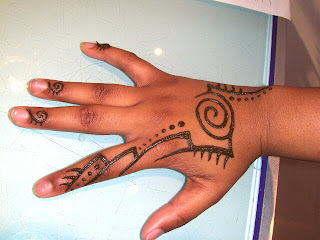 A variety of complete designs using these henna elements from easy basic designs to moderate level henna designs. It includes 4 pages of henna information about the science and art of mehndi, a page of basic henna design elements, 2 pages of henna design fillers, and 13 pages with full hand designs. 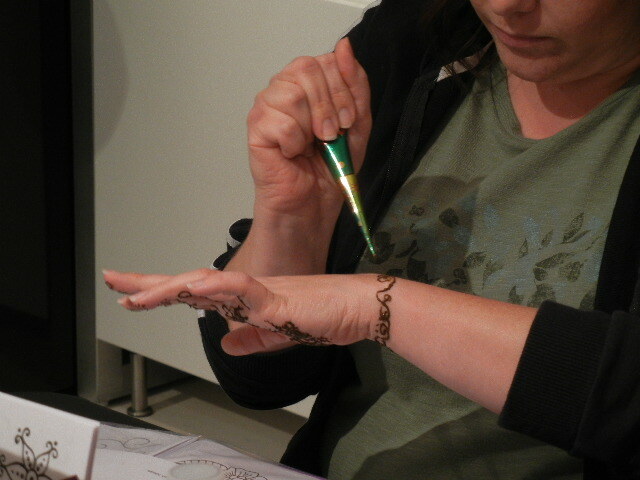 Individual henna designs are also scattered throughout the book. There are 25 total printable pages. If you are new henna artist, this eBook is a must-have (especially at only $6.99!). 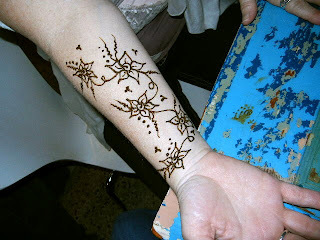 There are also some great designs for more advanced henna artists and great festival style henna designs. This eBook is specially designed to be used for events such as fundraisers or festivals, with the beginning henna artist in mind. The henna designs in this design book are quick and easy to create It's packed full of information to help the henna newbie through their first few events. The Henna Fundraiser eBook includes 4 pages of henna information about the basics of henna and tips for doing mehndi for an event setting, including pricing and set up suggestions. There are 5 pages of small individual henna designs and 35 individual easy hand henna designs. There are 32 total printable pages. If you are new to henna and doing an event (whether it's a fundraiser, festival, or party) this is the eBook for you. This is just the start, so get your Beachcombers Henna eBook collection started! 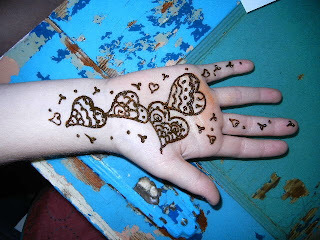 I've added a new henna sign on our free henna downloads page at our henna help site, www.ShopHenna.com! It's a standard 8.5x11" sign with henna aftercare info. Just another fun thing to make doing henna easier for you! 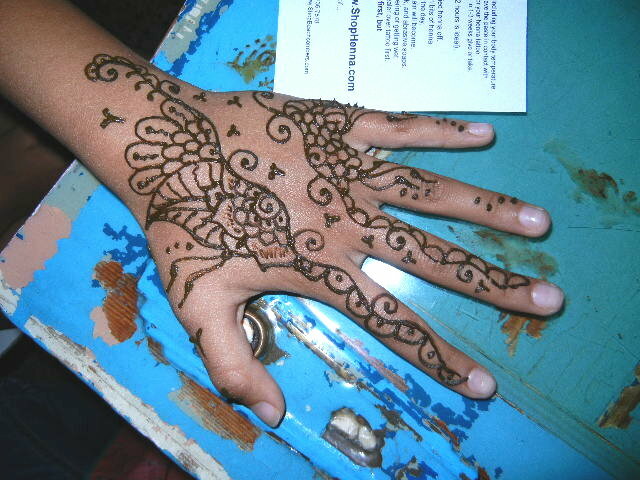 Enjoy all our helpful downloads on our henna download page. Everything is printable on standard sized paper. I opened for a a private shopping appointment for a long time customer, Shaida from Gainsville, on Monday. Shaida brought her husband, Peter, his sister Karina, and their friend Darci. Oh my what fun was had! First Shaida brought me a gorgeous long hippie dress with matching earrings as a gift! How incredibly sweet, right? Totally unexpected, but much appreciated! We were all in bangle heaven as we matched vacation clothes and swimsuits (they were on their way to Puerto Rico!). 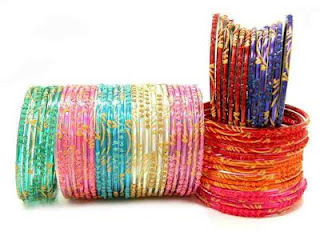 OK, Peter was not in bangle heaven with us, but he was happy to see them happy. Don't feel too bad for Peter. 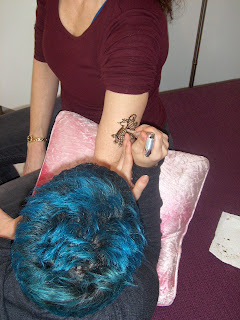 He was the first to get henna! We did the coolest henna on him. 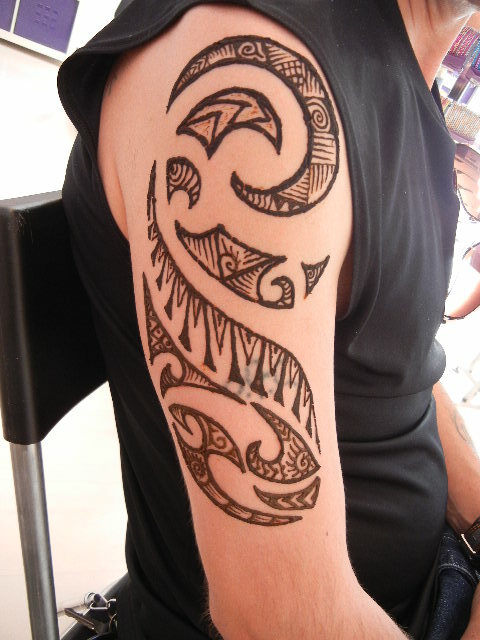 We did a Maori tattoo style which was the first I've ever done. In fact I didn't even know what it was until he told me about it. To describe a Maori tattoo (Ta Moko), think of a tribal tattoo but instead of solid black the tattoo is filled with patterns. Though beautiful, these have deep cultural meaning as well. We didn't have the time to research meanings and we were doing henna instead of a permanent tattoo so we focused on the artistic side of the Maori tattoo style. Next came Shaida. A sea turtle and hibiscus were her requests! 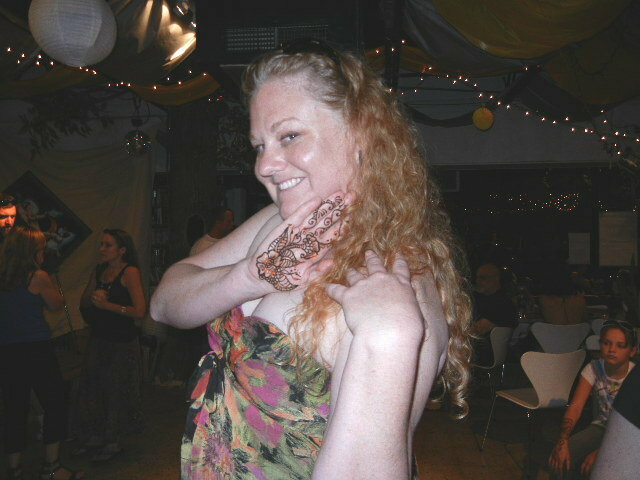 Her henna tattoo is island fun! For Karina we did a beautiful floral back design that works well with her swimsuit. After the henna and shopping we grabbed burgers at Graffiti Junction which is a block away. What a fun day! Thank you all for such a great time! A nice selection of rainbow bindi body stickers just came in. 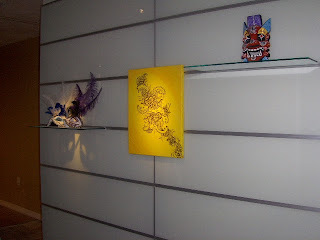 I'm delighted with some of gorgeous intricate new styles. Bindi are the ultimate summer time accessory. Bright, fun, and airy. Much better than heavy hot jewelry such as metal. I love to wear bindi traditionally between the brows on the forehead, but it's great to pop one on the cheekbone or near the collarbone as a floating necklace. However you decide to wear your bindi, wear them with pride! It's been awhile since I've had time to post. Many apologies! We've been busy at Beachcombers Bazaar. I'll post often to get you all caught up. 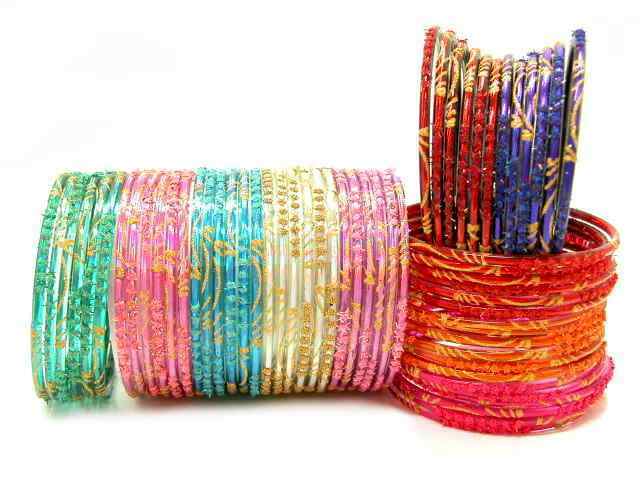 Remember those new glass bangles? WOW! They are flying and they are gorgeous! I've been releasing new designs on the website every few weeks, so be sure to check in often. Shop the new styles while I still have them, and be sure to check out our regular glass bangle category for sets you have missed. I promise more articles to come! There are really some spectacular new bangle styles from our last order! I've created some great glass bangle kits for you so you can get new styles in a variety of colors. The below bangle kit uses thicker wedding bangles with silver glitter. 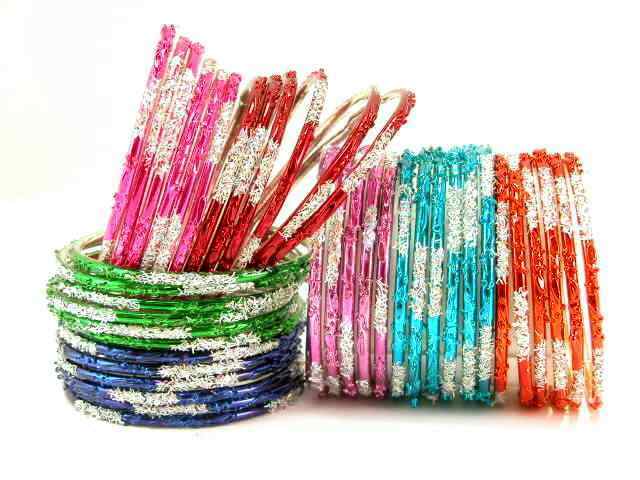 I also have this style glass bangles with gold glitter and matching glitter bangles. 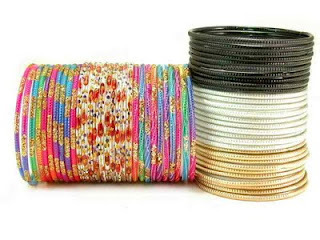 The below glass bangle kit is designed to let you mix and match with all your other Indian bangles. Adding a bit of black, gold, silver, or color can make a bangle set completely different. The below Indian bangle kit is positively gorgeous in person. It has a gorgeous holographic base. Color and light sparkle like crazy in this modern Indian bracelet style. One of my new favorites! 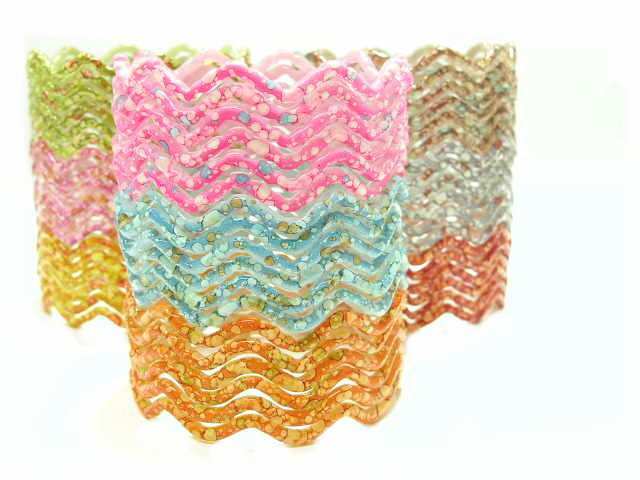 We are the first in the USA to get the below glass bangles! 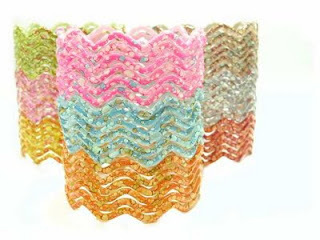 This new zig zag bangle style is really made of glass and has a super modern "water spot" finish. Shop the new Indian bracelets today! Having these makes me happy!!!!!!! Featuring Heather Stants of Urban Tribal Dance Co.
Black V Tribal, Blue Caravan, Silver Sage, Lacey Sanchez, and many more from Florida! Connecting to the core for more powerful movements. Through years of training in dance, pilates, and yoga Heather has developed a strong technique and practice. Students will be lead through exercises, drills, and movements that exemplify Heather's approach to powerful and expressive movement. Bring a yoga mat. Urban Tribal Dance Company is known for complexity and creativity. Learn some of the movements that make up the current UTDC repertoire and then string them into fabulously funky combinations for use in improv or choreography. "Creative Dance Composition for Improv and Choreography"
tribal fusion style. Learn the technique and tricks. Bring kneepads and a yoga mat. 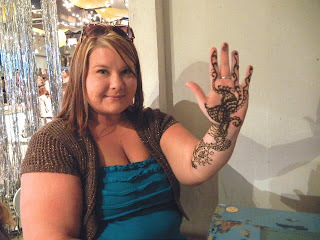 Congratulations to Janet our current Henna Design Of the Moment winner! Janet was concerned that upper arm henna can be masculine, so she created this gorgeous feminine paisley design. She said she had never seen anything quite like it, and she hasn't done anything quite like it since. 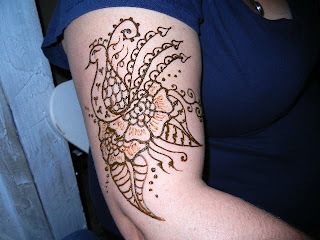 The more I look at Janet's henna design, the more unique it seems to me. Janet won a $15 gift certificate to our website or store! Use it well, Janet!!!!!! This is another design by Janet that is LOVELY! A beautifully done pregnant belly with a trailer creeping up between the breasts. A HUGE Congratulations to Florida Tribal Dance for opening up their own studio! Yay for another small woman-owned business on it's way to success! Join Beachcombers at the Florida Tribal Dance fundraiser, "Help Our Garden Grow". Admission is $5 and includes a great show from both Florida Tribal Dance troops. There is a silent auction with some incredible items to score, along with legacy art to participate in, henna tattoos (by me with all proceeds being donating to Florida Tribal Dance), and sooooo much more! It's going to be an AWESOME time! See you at the Fundraiser! You may know that we just returned from vacation. 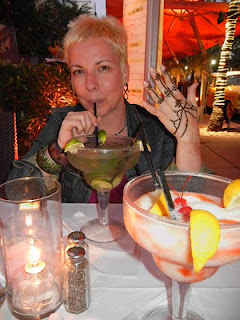 I certainly didn't take vacation from henna! This is a picture of me on Atlantic Ave in South Beach. While waiting for our food, I broke out some henna and hennaed away! 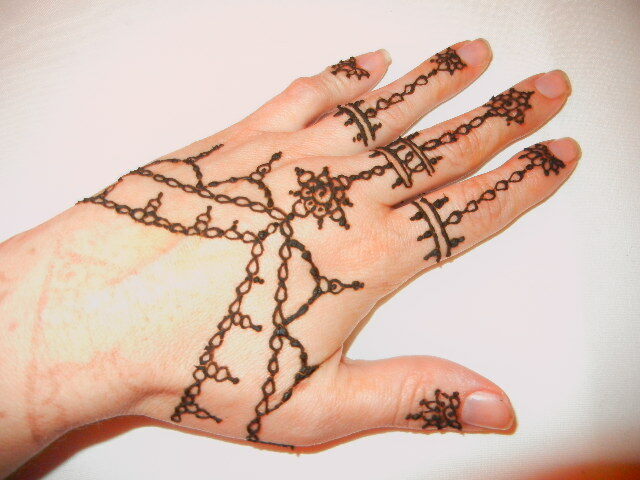 Jewelry style henna for vacation. It was a quick easy style, but had plenty of impact and left a lovely stain. 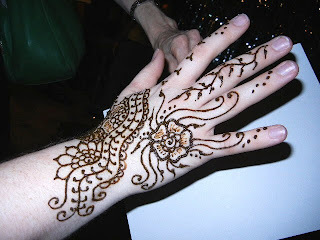 March is the start of henna tattoo season, so it's time to get wound up and ready for spring and summer henna! Just got a small order of bright colored khussa for spring! There is a spectacular bright orange with iridescent beading. 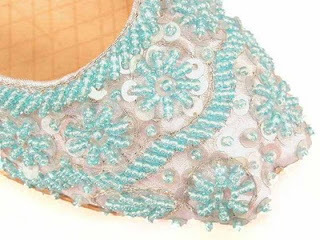 These are in the same beading style as our current magenta khussa shoes. The coolest style ever! A lovely dark navy that looks beautiful paired with bright colors or neutral colors. A nice way to get away from plain black as a basic. Spring would not be complete without a nice bright fuchsia, cerise! Teal is BACK! I've been getting some requests for this one, so snap them up if they are on your list. They will sell quickly! The coolest dark red ever is in this order! 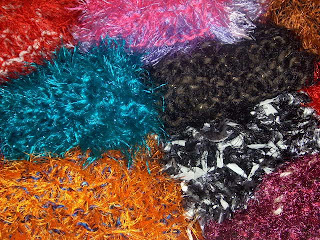 They have a rich color with iridescent sequins. They are head turners! The next order will mostly be whites, golds, and silvers, so if you need color for the summer, get these while you can! New Shoes! It's a good day! Store will be open March 1!!!! Are you missing us? We are missing you! The store will re-open, Tuesday March 1, after being closed for 2 weeks while we vacationed and did inventory. Stop in to see us! Grab some henna, pick up a gift, restock your bangles, or just say hello! Check out these new works by Shalini Tandon in Batik silk. 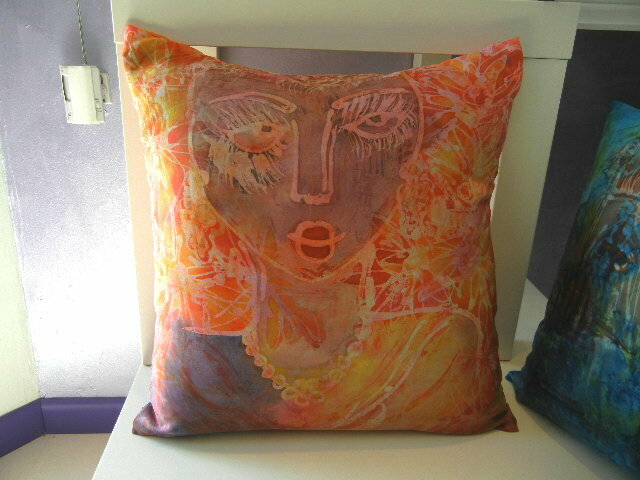 Both are pillows and GORGEOUS! What a great way to add some artistic attitude to your living room or even a bedroom. In person they are positively BRILLIANT! Especially at only $49.99. Absolute bargain! Store Closed & Shipping Delay Notice! Now I LOVE what I do. I really really love running Beachcombers Bazaar, but by Goodness, I need a vacation! Since we used our winter holiday to organize and inventory new product, we are taking a vacation! That's right, a REAL non-working vacation that we haven't had in years and years! There will be no shipping or emails while we are away. I'm sorry for any inconvenience, but think of the excellent service you will get when we return! Shipping will resume Tuesday, February 22, 2011. Store will be closed an additional week and will re-open Tuesday, March 1, 2011. If you need us, this is the BEST way to contact us. We will have limited access to email, but we will answer as soon as we possibly can. All phone messages will be returned Tuesday, February 22. Please be patient and we will respond to you as soon as possible. We will be accepting online orders, but shipping will be delayed until Tuesday, February 22. Our store will be closed an additional week and will reopen Tuesday, March 1. If you need a henna tattoo while we are out, please visit our local Orlando henna artist list. Have a great time while we are gone. We'll be sending relaxing vacation energy to you! We are very lucky here in Florida with our gorgeous warm weather. I thought we should share the love so for the rest of THIS week, stop in the shop and purchase any karma scarf by Celia and I'll ship it to any USA or APO address for FREE! 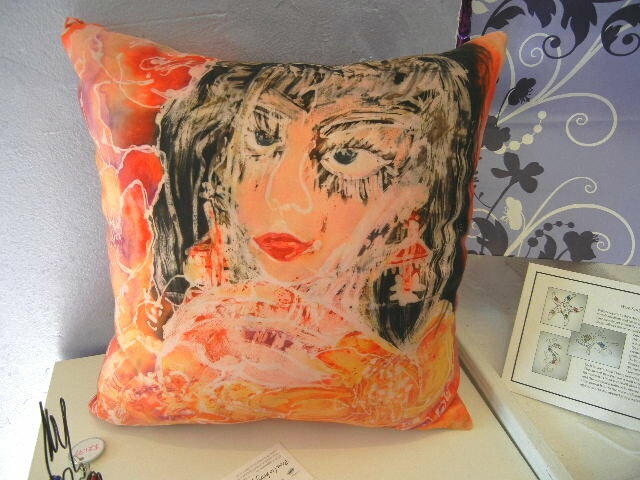 Celia is a local Maitland, Florida artist that has me captivated with her handmade scarves! I discovered her secret. She loves making her scarves, and she only makes them when she is feeling happy, good, and positive. I'm convinced these good feelings are infused into her work. 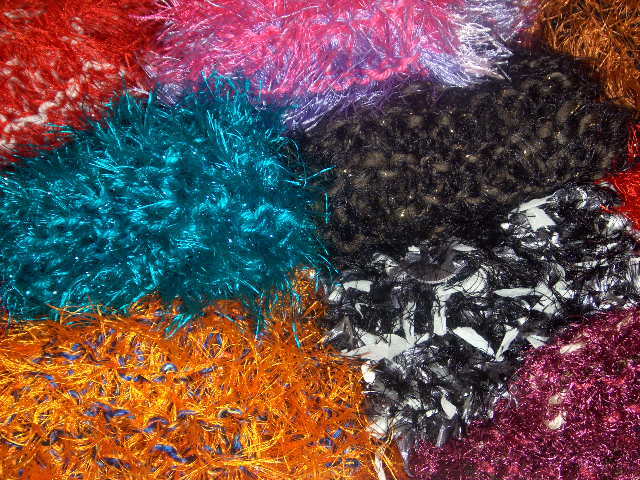 These fantastic knitted scarves are soft, warm, bright colored and spilling over with good vibes and good karma! Put on a brightly covered karma scarf and drink in the positive vibes. Wrap yourself or someone you love in good feelings! Remember, this week only, I'll ship a karma scarf to any USA or APO address free! 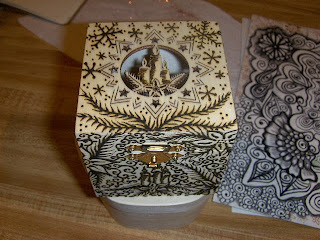 I have recently started doing henna on objects other than people. SUPER FUN! I'm still very new to this, but I want to share what I've learned so far. 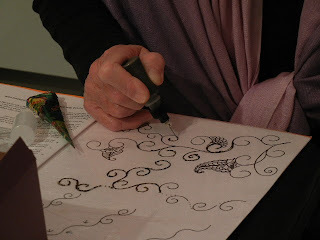 When you henna objects, you have the choice of leaving the henna paste on or scraping the henna away and using the henna stain as your art. just like you do on the skin. When you want to leave the henna in place such as the Unity Candle and the Canvas I hennaed, I've found my traditional Beachcombers Favorite Henna Recipe works well. 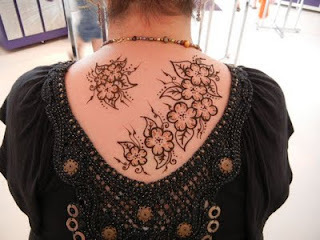 If the henna will stay on the item, it's important to not have too much cracking and for the henna to adhere well. 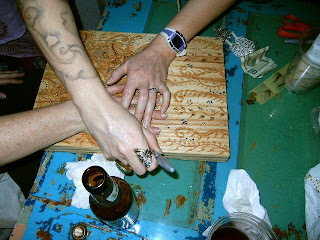 The sugar in the Beachcombers Favorite Henna Recipe helps with this. You will also need to use a sealer of some sort or the henna will scrape away. For this candle, I wanted to use Candle Kote or Candle Luster, but I couldn't get them in time for the wedding. You can also use a dip style candle sealer, but upon reading reviews, I found it can be a bit tricky and I didn't have time for experimentation. 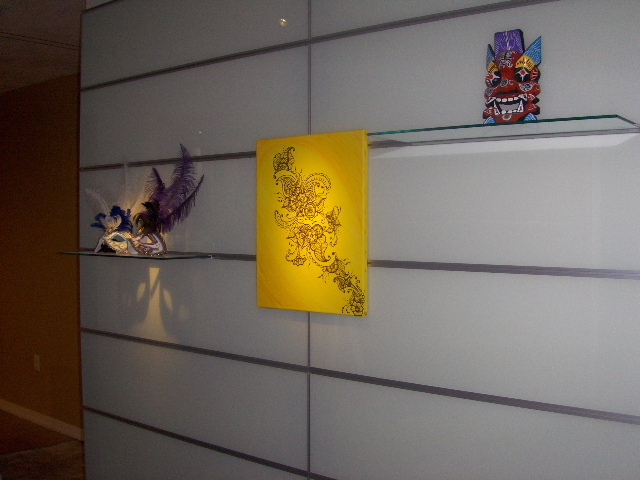 I ended up using a clear acrylic based sealer (don't use lacquer sealers as they can be flammable, even when dry). I sprayed five thin coats after the henna was completely dry, letting the sealer dry in between coats. I think Modge Podge may work beautifully as well, so I may try that next time. This was a gift for my mom for Christmas. I used a standard canvas that was already stretched on a frame and painted a background with basic acrylic paint. I let that dry completely and then used the Beachcombers Favorite Recipe Henna to free-hand a henna design over the surface. 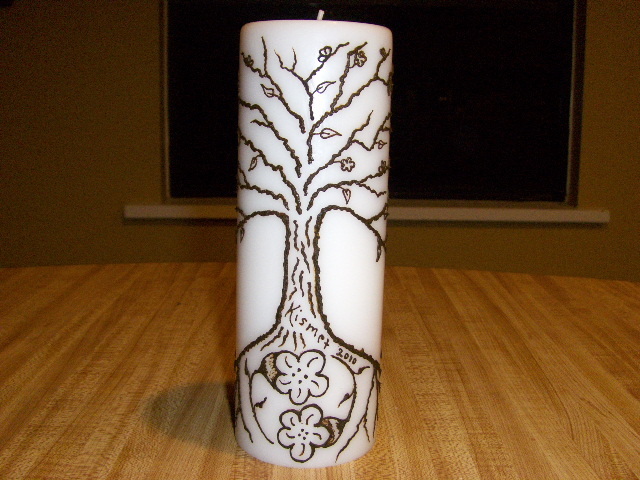 Like the candle, I let the henna dry completely and applied a clear acrylic sealer of the entire canvas in light even coats. As I recall I did about 8 thin layers of sealer because I had to ship it from Orlando to my mom in Ohio. It arrived safe and sound with absolutely no henna having fallen off! 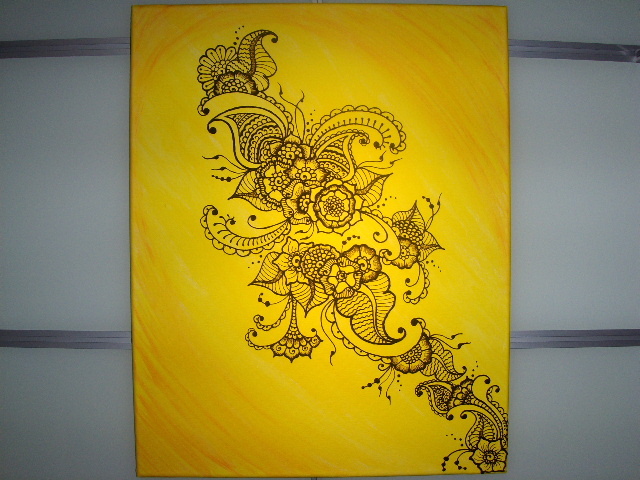 This picture is still hanging on my Mom's wall with all henna attached. There isn't a single piece that has fallen off! 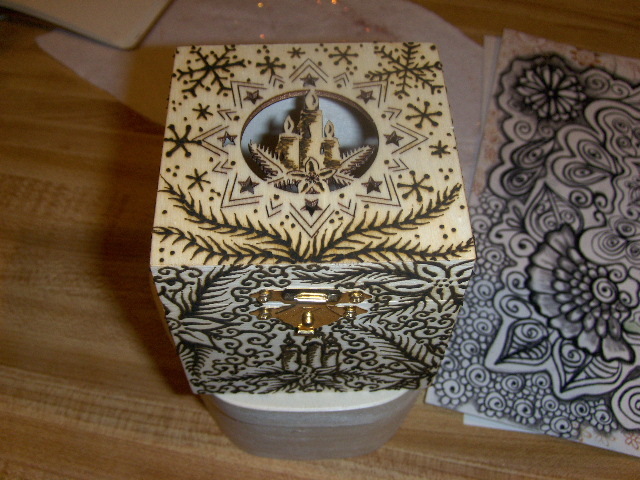 This was a small balsa wood box I got for my Grandmother for Christmas and I hennaed it up! I decided that I was going to remove the henna instead of leaving the paste on the box. I used my normal Beachcombers Favorite henna mix, but the next time I henna something with the intention of removing the henna, I will mix henna without any sugar in it so that it comes off easier. Applying dry heat helped to remove the henna. 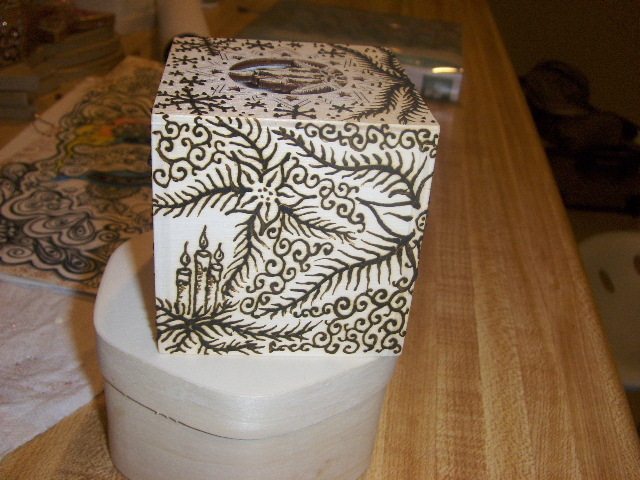 I let the henna paste sit on the box for a bout a week then I removed the henna the day before I saw my Grandmother. The stain was a nice warm brown. The next day, I noticed the henna had already darkened slightly. I expect it will continue to darken over time just like a stain on the skin. This Christmas, my Grandma had the box sitting out for decoration and the color has deepened to be so dark it's nearly black. It's a very deep walnut brown. So there it is! My experience with hennaing objects so far! 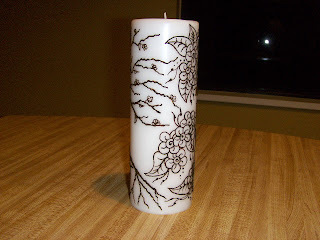 I plan do do a ton of other fun things with henna throughout the year, so I'll post more ideas and tips as I learn. I hope I'll hear from those more experienced than I, so that I can avoid mistakes or "learning opportunities" as I like to call them. Learn more about henna at The Henna Learning Center here. 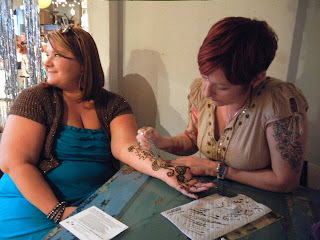 What a fun henna class! Saturday was our winter henna workshop and, oh my, what fun! 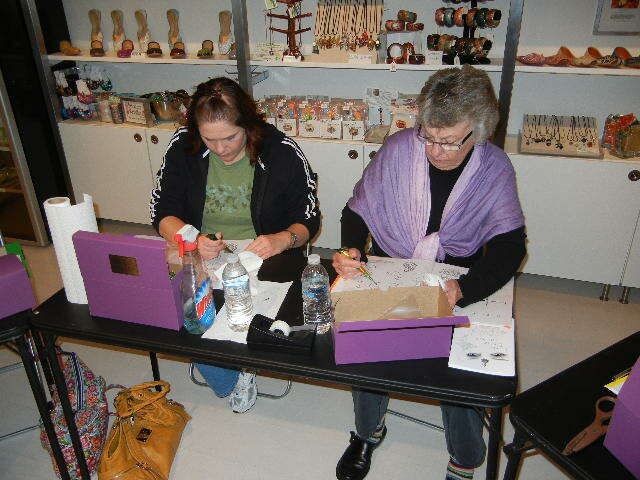 It was the first time in a long time the class did not sell out. I had 6 students in the class. Tons of individual attention and plenty of jokes and laughter. Perhaps I should further limit the size of the henna workshops to eight. I think I've imparted some serious henna addiction to these students! 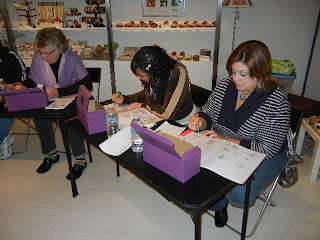 Until the Spring henna class! Whew! Our glass bangles came in just before Christmas and I am slowly but surely making a dent in organizing and cataloging them. That's 1500 boxes of bangles that need to be sized, separated, cataloged, shelved, and inventoried. I hope to have them done by the end of February. Woo Hoo! Our new Indian khussa are FINALLY here! I understand the delay due to floods, but I'm so glad to have them! There are some beautiful styles including a gorgeous magenta khussa. Not quite purple, not quite fuchsia...it's GORGEOUS! 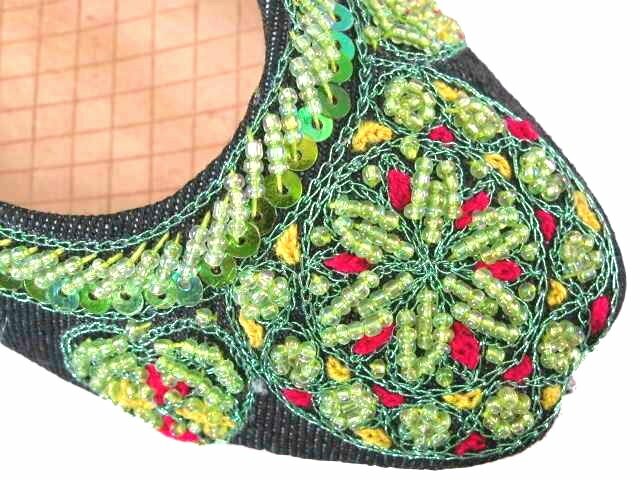 I am also excited to have brought back a denim style khussa with awesome lime green beading and bright pink yarn work. For all you brides, I have a nice selection of warm white/ivory and cool white khussa flats. There is a brand new style that I am excited to have, cool white with light blue beading. Perfect for your "something blue"! I hope you feel they were worth the wait! They are selling fast so get the styles you like while you can! Shop khussa on our website now. It's a New Year! 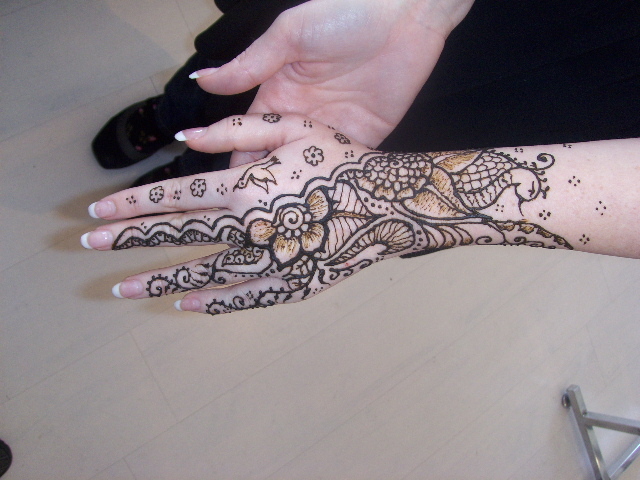 Do more henna! How about a happy easy goal for 2011? 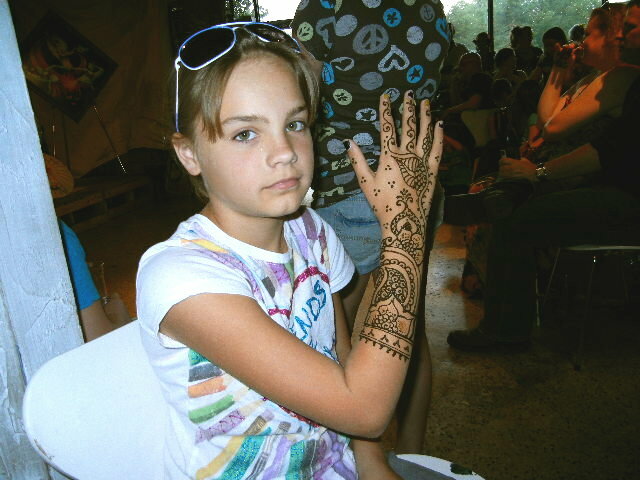 Do more henna! 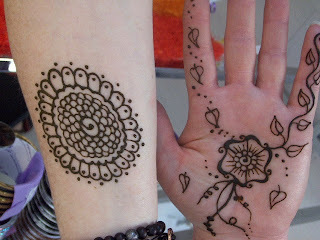 Henna has a wonderful positive energy that can help you direct good energies towards every aspect of your life. Henna is relaxing and energizing at the same time. 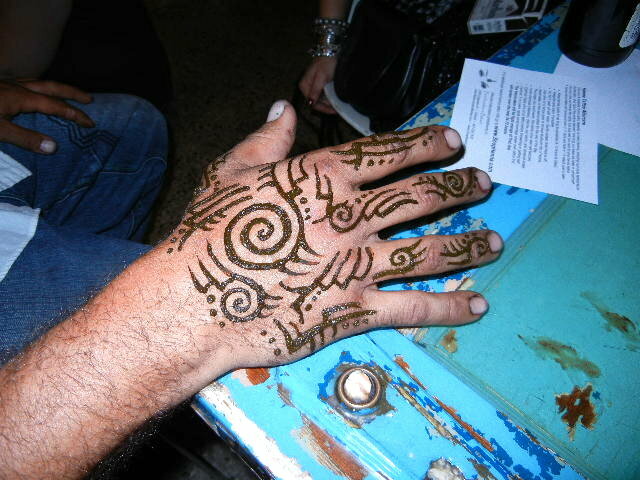 You can't help but feel good when you are doing henna or getting henna done. 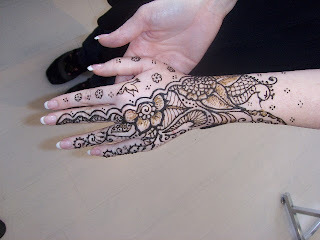 As a creative outlet, henna can be used in a million different ways. Body art (of course! ); on candles; silk and other fabrics; on wooden items including picture frames, boxes, and more; canvas; or even paper. Henna is a great way to bond and relate with others. Your partner, your friends, family, and even friends-to-be. So, do more henna! Henna-fy your 2011!